House Hearing on CAPTA – Good News? 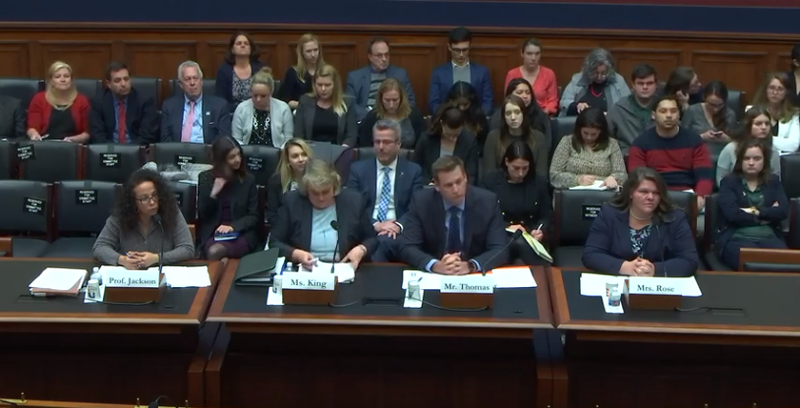 The U.S. House Subcommittee on Civil Rights and Human Resources held a hearing on Tuesday, March 26, regarding efforts to reauthorize CAPTA—the Child Abuse Prevention and Treatment Act. While we were not able to get onto the witness list, our D.C. liaison Maggie McKneely was on hand for most of the hearing in person. I was able to watch the entirety on the YouTube channel of the House Education and Work Force committee, of which this subcommittee is a part. Perhaps more importantly, we were able to share our thoughts and concerns with members of the committee before the hearing even began. First passed in 1974, CAPTA has since been reauthorized several times, always with amendments and changes to try to make the law more effective (with at best mixed results). With Democrats controlling the House and Republicans controlling the Senate, CAPTA is one of the few issues both parties favor working on this spring. Fortunately, it seems everyone is aware that the current system is broken and must be fixed. The hearing on Tuesday was the first opportunity to catch a glimpse of what changes lawmakers might be considering this time around. The signs were positive for at least some of the changes ParentalRights.org and our allies are working for. For starters, the whole hearing was cordial. Anyone not “in the know” would have a hard time guessing which witnesses were enlisted by the Democrat majority and which was invited by the Republican minority. All four were largely in agreement on most of the issues addressed by CAPTA. They were especially unified around the idea that prevention measures to keep families together are better than reactionary or punitive measures such as those employed by child welfare agencies under the current system. On this we agree. More than one witness made the assertion that prevention involves educating and supporting parents, as opposed to looking for ways to “catch” them and take their children. And we found one exchange particularly encouraging. Rep. Hayes (D-CT), who was a classroom teacher (and mandatory reporter) before her political career, expressed the need to know that when a report is called in, the actual underlying issues will be addressed. She wanted it clear for the record that abuse or neglect can happen anywhere, not just among poor minority families. Dr. Yo Jackson of Penn State, one of the witnesses and a researcher by profession, gave a welcome response. “We are much better now, where we are in our science, at knowing what are the causal factors for child maltreatment,” she declared. Now that we have been tracking for a few decades, we have a lot more data. Families where abuse occurs have certain things in common, certain warning signs, like stress, lack of outside support, or conflict within the family. We are able to identify underlying issues, Jackson went on, and “[p]overty is not one of them” (Jackson’s emphasis). Obviously, such research can be taken too far. Over-zealous investigators may spot one or two “warning signs” and begin harassing innocent families without cause. Such “predictive analytics” are not an idea we would endorse. On the other hand, testimony like Jackson’s bodes well for our “poverty is not neglect” language. Far too many families have been destroyed because parents lacked the resources to provide for their children at a level an investigator feels is necessary. Children are taken and placed in wealthier families, at a greater expense to the state than just helping the parents pay the rent for the month. While we won’t know until a draft is available in a few weeks, we have cause to hope this “poverty is not neglect” provision will make it in. We have heard from members of the committee that the memo we have shared, alongside our allies in the United Family Advocates bipartisan coalition, has been instrumental in bringing at least some of our issues to the forefront. We won’t know to what degree until we see the CAPTA draft, but it is exciting to know we’re affecting the discussion in favor of parents and families. Thank you for standing with us and for supporting our efforts with your donations. Because of you we are able to be on hand, not only to monitor and report, but to educate and influence committees just like this one. P.S. — I am aware some of our readers will hold that CAPTA should be defunded altogether. Our best estimate of the political reality, however, is that CAPTA will be reauthorized in the coming months. Our best chance at protecting children, then, is to be sure the law is modified in a manner that helps, and does not harm, our families.